My brother Kurt loves to fish and his good luck fishing shirt is Captain Crudd. 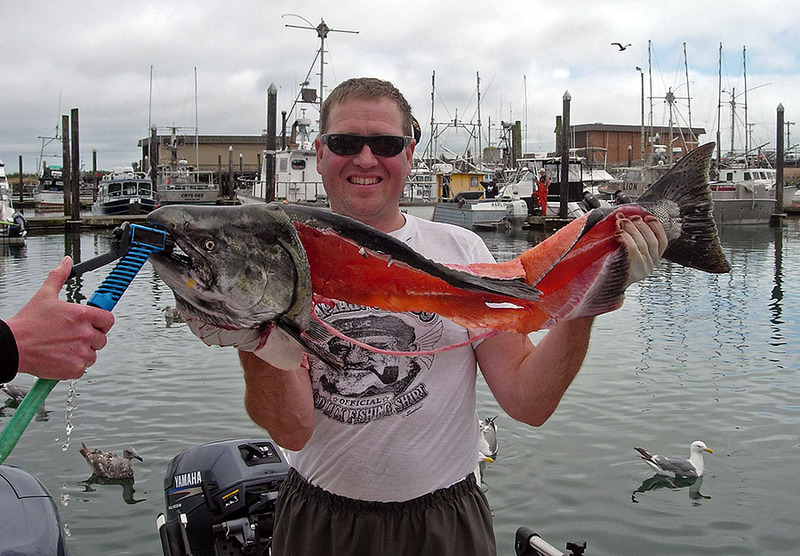 So while I've got a few BBQ Grill recipes myself, here's a few tasty ones from Captain Crudd - came in handy after the 400+ pound slayfest in Seward Alaska. 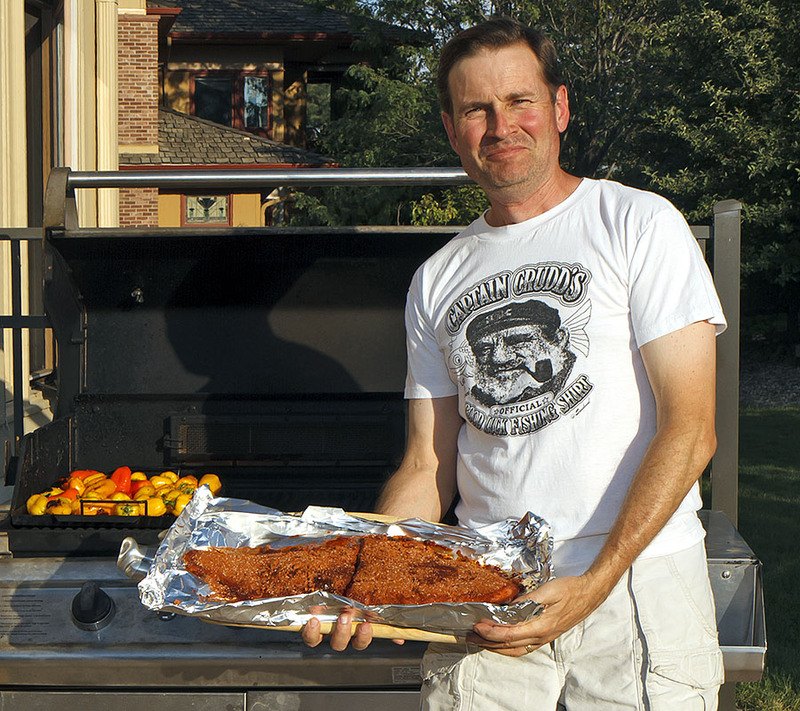 Scroll down to see some pictures of the Slab-o-Salmon! You can use left over Halibut from the night before too. And here are a couple of up-scale recipes from Captain Crudd's wife. Chef de Cuisine Cliff Wharton and Executive Chef Jeff Tunks of TenPenh Restaurant . Washington, D.C.
Preheat the oven to 350 degrees. Place the macadamia nuts on a baking sheet and toast until golden. Allow to cool completely. In a food processor, puree brioche. Add the cooled macadamia nuts. Pulse until a crumbly mixture is formed. Pour crust mixture into a shallow dish and set aside until needed. Cut the halibut into 3 ounce pieces and season with salt. In a shallow dish, combine the eggs and water to create an egg wash. Dredge the halibut pieces in the egg wash and then coat the fish completely with the nut-crumb mixture to make a nice crust. In a non-stick pan, heat the oil. Sautéhe halibut pieces until the fish is golden brown on both sides. 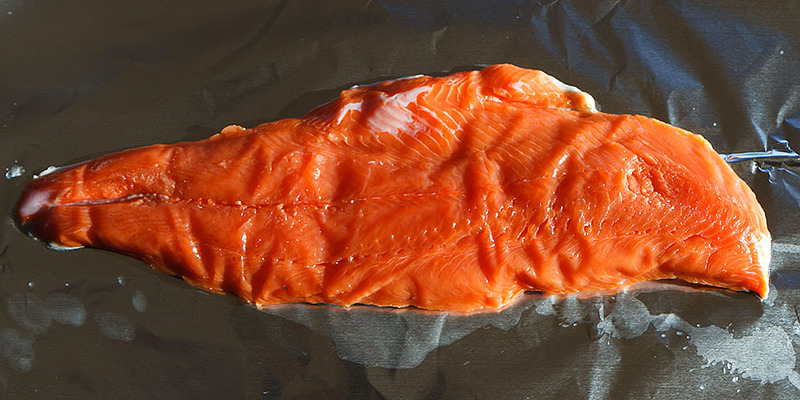 Remove the fish from the heat and place on a baking sheet. Set aside until needed. Peel the mango and remove all the meat. In a small saucepan on medium heat, combine the mango meat with the sugar and white wine. Allow the liquid to reduce in volume by three quarters and then add the cream. Bring the mixture to a boil and then simmer for 5 minutes. Let the mixture cool slightly. In a food processor or blender, puréuntil smooth. Strain the mango puréthrough a sieve and into a bowl. Add the lime juice and season with salt, to taste. Set aside until needed. Prepare the Scallion Oil: Fill a bowl with ice and cold water. Bring a pot of salted water to a boil. Quickly blanch the green parts of scallions in the boiling water for 10 seconds. Strain the scallions from the pot and then immediately shock the scallion in the ice water to stop the cooking. Remove the scallions from the ice water and squeeze out any excess water. Dry the scallions thoroughly on paper towels. In a blender, combine the scallions with the olive oil, salt, and sugar. Puree mixture until smooth. Pour the scallion oil through a fine sieve and into a squeeze bottle. Set aside until needed. Preheat the oven to 350 degrees. Place the black sesame seeds on a baking sheet and toast for approximately 5 minutes. Allow to cool completely. 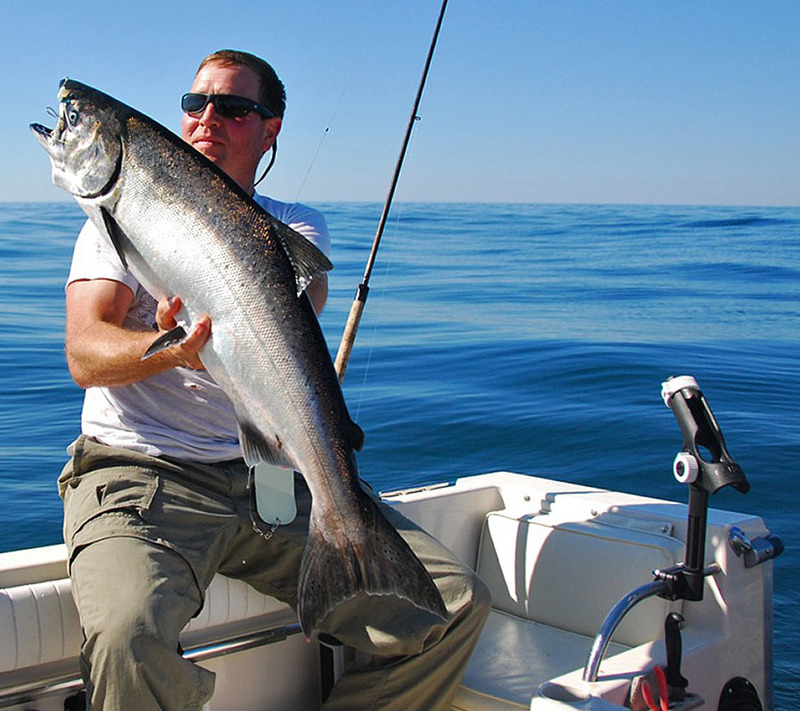 Place the baking sheet of halibut into the warm oven and heat for approximately 5 minutes. Ladle a generous amount of warm mango puree onto the plates. Place the halibut in the center of plate on top of the mango puree. Garnish with a drizzle of scallion oil and sprinkle the sesame seeds around the plate. Serve immediately. Serves 4 with Jasmine Rice. While heating grill up to medium, place salmon on tin-foil, and lightly brush olive oil on top, generously coat salmon with rub, cook until done ... and then enjoy! 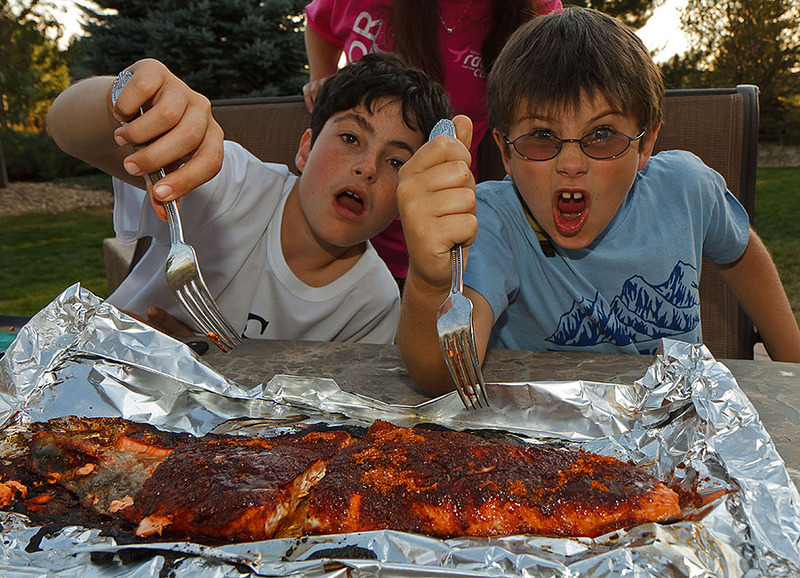 Captain Crudd's nephews (Dirk and Kyle) about to devour the Slab-o-Salmon! 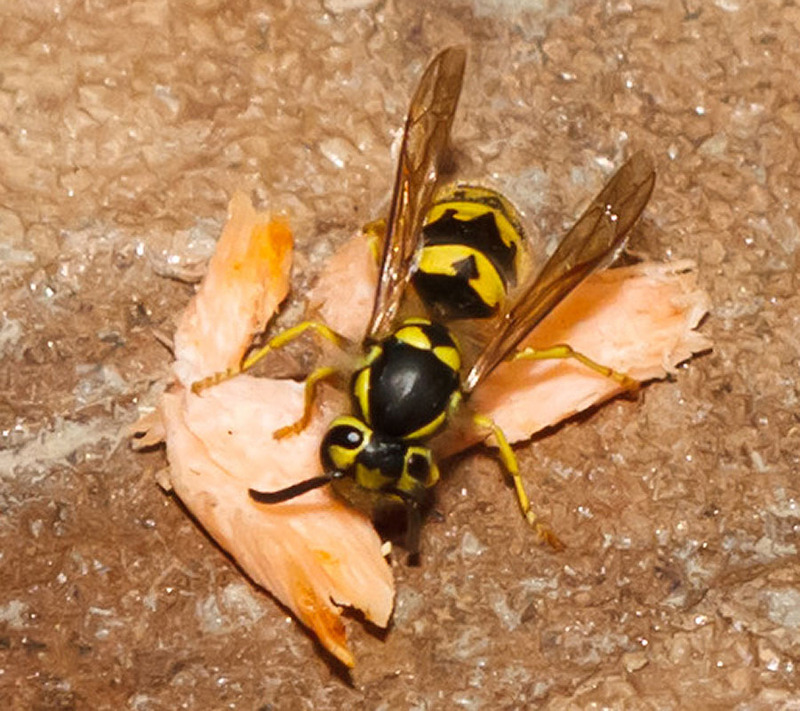 The Wasps were happy to finish off the scraps - they actually flew off with big chunks!